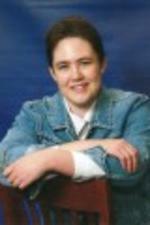 Glenbrook features many nation-wide mall staples – J.C. Penney, Sears, Macy’s, Christopher and Banks, and Carson’s. There are also restaurants in the mall, like TGI Fridays and Red Robin, to name a couple of the sit-down places. Then there is the food court with Chick-fil-A, Charley’s Grilled Subs, Subway, and wonderful-smelling far-eastern cuisine. Keep wandering the halls and you’ll find Auntie Anne’s pretzels and Orange Julius, too. But what do the kids get to do, besides munch at the food court? 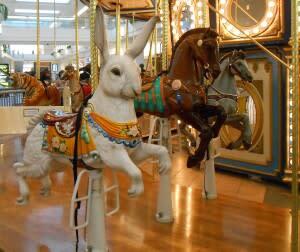 Check out the Glenbrook Carousel, located near the ground-floor inside entrance near J.C. Penney. This double-decker carousel features all sorts of exotic animal rides – tiger, elephant, rabbit, giraffe, and zebra. There are also a few regular ponies, too – some with jeweled saddles. A few bench seats are mounted on the carousel, in case an adult wants to come along for the ride without climbing atop a prancing triceratops. The music has that classic, carousel sound – and the ride isn’t so fast that it will scare young riders. Parents can stand beside their children, if the young rider is small enough to need a little support during the trips round about. And the carousel tender is happy to run the carousel even if only a couple of kids show up, wanting a ride – you don’t need to wait for a group. Tokens for the carousel ride can be purchased right there, with the cost at two dollars per token. The more tokens you buy at one time, the cheaper it is in the long run. Another fun place to explore is the Inside Scoop shop, located on the second floor of the mall, near the food court. 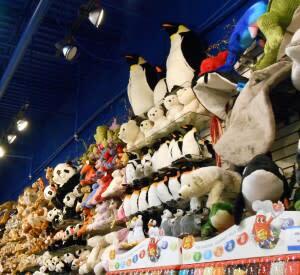 This shop has more stuffed toys than you’ll see in many big-box toy emporiums. Inside Scoop has clear drums of jelly beans everywhere. Simply choose the flavor you want and fill a bag, like you do in the produce section of the grocery store. Stuffed toys line the walls. You can find everything from an economically-sized porpoise to a giant penguin, panda or manta ray. Be careful – the toys are stacked on shelves that stretch well up out of normal reach. You may need to get some assistance from a clerk if an especially cute plush animal catches your eye but isn’t quite at your fingertips. If you just need a place to park and rest your feet for a few minutes, check out the Glenbrook fountain, located right outside the first floor inside entrance to the J.C. Penney store. A topiary bear dances in the center of the fountain while cascades of water stream and bubble through a variety of platforms. 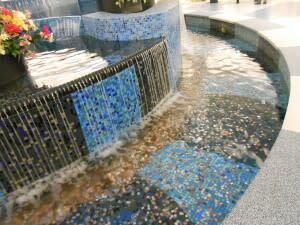 Wide, low ledges all around the fountain serve as handy seats while kids enjoy throwing change into the water. Don’t worry, the entire fountain is fairly shallow and not too wide, so you can protect little ones from taking a dip in their street clothes. If you’re coming to Fort Wayne and thinking about doing some shopping, check out Glenbrook for a family-friendly experience. There’s a little something there for everyone!